Image: Penwell Dlamini Olivia Makete stands outside her shack in Orange Farm Extension 10, south of Johannesburg. 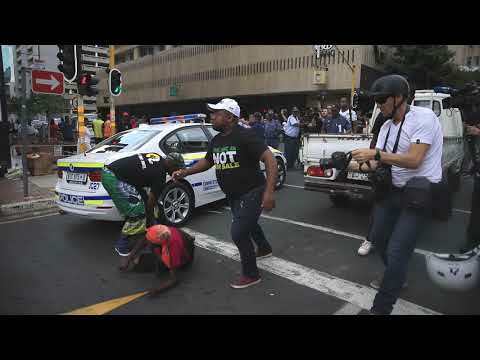 She told TimesLIVE how she suffered at the hands of ANC members outside Luthuli House in an assault caught on camera by Sunday Times photographer Alon Skuy. Olivia Makete struggled to walk when she woke up on Tuesday‚ still in agony after being kicked by ANC members "defending" Luthuli House. The 52-year-old woman – who was photographed on Monday being hit off the back of a bakkie, kicked while on the ground and scrambling to get away following an attack at the hands of ANC members - was sitting on the river bank at Orange Farm Extension 10 in Johannesburg‚ helping her neighbour wash a carpet, when TimesLIVE tracked her down. It was about midday and a throng of journalists finally got to meet the woman whose assault was captured by Sunday Times photographer Alon Skuy. The brutal images forced the ANC to immediately suspend branch secretary Thabang Setona‚ who spent the night behind bars at Johannesburg Central police station. Image: Alon Skuy This image of Olivia Makete being kicked by an ANC official outside Luthuli House on Monday sparked widespread anger. He was one of the people dressed in ANC regalia who attacked Makete and other residents as they drove past on the back of an open bakkie. Makete said she had not been at Luthuli House to protest in support of President Jacob Zuma. “We were going to handover a memorandum about service delivery. We need water. We need houses. We need electricity at Orange Farm Extension 10. I have been living here since October last year,” she said. “We left Orange Farm in the van and when we got to town the car took a wrong turn. The road was closed but the police then opened it for us to go through. When we stopped at a traffic light‚ just opposite Luthuli House‚ a group of ANC people started assaulting us. Makete lives with her husband in a small shack. Her entire informal settlement does not have water‚ electricity‚ sanitation or even roads. It is situated along the Golden Highway‚ not far from the Orange Farm taxi rank. She and her husband do not work and survive on their two young children’s social grants. They have two older children‚ aged 26 and 30. Members of Black First Land First (BLF) promised to take her to a doctor so that she could fill in the necessary paperwork to open an assault case. According to a tweet by an SABC reporter‚ she went to the Orange Farm police station on Tuesday to open the case.